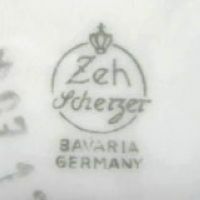 The company 'Zeh, Scherzer & Co.' was founded in 1880 and directly started to produce a wide range of pieces including coffee and tea sets, normal household items and tableware as well as decoration porcelain. Items made by the company at a time also caught the eye of the Geo. 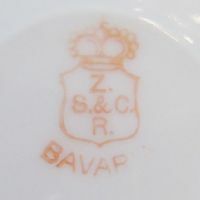 Borgfeldt & Co. company and during January 1907 and May 1908 'Zeh, Scherzer & Co.' produced a series of items exclusively for the company from New York, based on an agreement between Borgfeldt and Zeh who had met earlier. 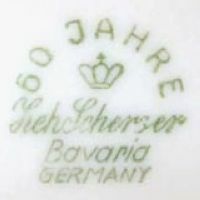 Being very successful in decoration porcelain, the company opened its own art department in 1908 and next to many other famous designers also Professor Fritz Klee (who later became director of the Königliche Fachschule in Selb) was employed as advisor. The resulting products were quite spectacular and even today remain a valuable addition to any art deco collection; next to figures of normal human beings, quite a remarkable number of animals and fantasy figures were produced over the years. 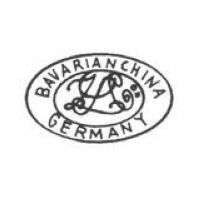 Based on the ongoing success of the business and the drastic increase in sales after opening the art department, the company was changed into an limited company on October 7th 1910. 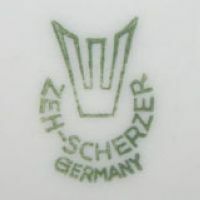 After becoming a limited company, the business started to expand gradually as the name of Zeh, Scherzer & Co. established itself on the German market. The design department and the art department had started to work together closely, exchanging ideas and successfully integrating art elements in normal household products. With such trained designers, the design department itself was no longer necessary and was slowly disbanded from 1919 onwards. Some collectors like to point out that this was the geatest period of the company, resulting in some of the most beautiful pieces produced. 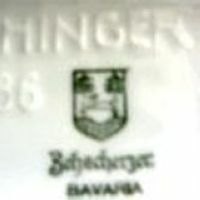 It should be noted here that between 1924 and 1935 the company also owned the Porzellanfabrik Elster, which was located in Mühlhausen in Saxony. 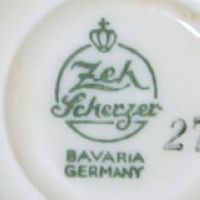 Even though the proprietors of that factory constantly changed, the marks remained in use relatively stable; the version used during the Zeh, Scherzer & Co. period is shown as Image [2.20] in the marks section below. 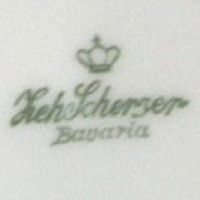 The following years saw a constant growth with minor set-backs now and then, but all in all, the company had a high-class reputation and was named together with other famous German manufacturers like Hutschenreuther and Rosenthal. 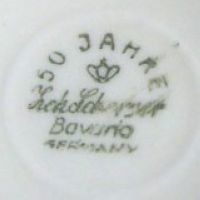 But just like the other porcelain manufacturers in Germany, the company had more and more problems to cope with cheap imports. 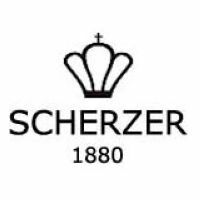 During this time, the company even reduced its tradename (and mark) to Scherzer & Co. or simply Scherzer 1880, which was easier to pronounce in other countries. But from the middle of the 80's onwards, sales were slowly declining. Up until 1991 the company was still privately owned, but then the majority of shares was taken over by the Allerthal A.G. investment company. Re-structuring the whole business and trying to prevent the inevitable was not the kind of solution that the Allerthal A.G. had in mind. 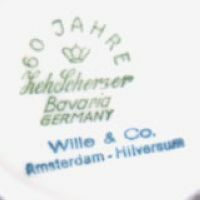 One thing that hurts most in any limited company are losses for the shareholders and the specialists from the Allerthal A.G. had various predictions for the German porcelain market - and none of them where positive. They instantly informed the other shareholders of a plan to save their money and called for a shareholder meeting. Production was instantly reduced and the company officially stopped production in 1992. After production had been shut down nearly everything of the former porcelain factory was sold and the resulting money was re-invested into the company itself which then started to invest in smaller companies and other real estate operations. 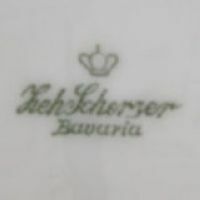 Even if the old name is still used by the holding (which is now fully integrated into the Allerthal A.G. investment group) it is unlikely that any piece of porcelain will ever carry the name of Zeh, Scherzer & Co. again. Some items may carry the an addition in the form of 'FACHLEHRER VEIT', 'ENTWURF VEIT' or 'ENTWURF: WILHELM VEIT STAATL. FACHSCHULE SELB'. These additions refer to the sculptor and modeller Wilhelm Veit, who was one of the main tutors at the senior technical college of the porcelain industry (Fachschule für Porzellanindustrie) in Selb. 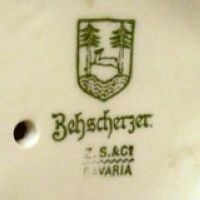 He created many basic forms for vases as well as various animal figures for the companies of Ph. 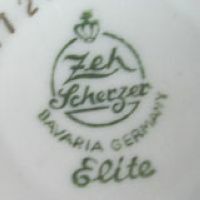 Rosenthal (Selb, Bavaria), Zeh, Scherzer & Co. (Rehau, Bavaria) and Gräf & Krippner (Selb, Bavaria). 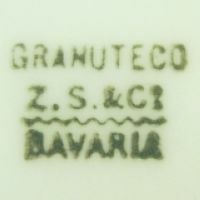 A few items produced between 1880 and 1910 also carry an additionally stamped 'GRANUTECO' addition which is an until now unidentified distributor/retailer mark - the same name can be found on items made by ⇒Krister Porzellan-Manufaktur (produced between 1904 and 1927) as well as products made between 1898 and 1918 by O.&E. Gutherz from Altrohlau, Silesia. 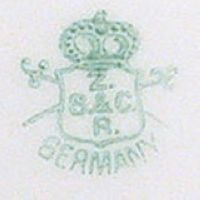 Used between 1880 and 1918, the well-known green version. Used between 1880 and 1918, very hard to find red version. 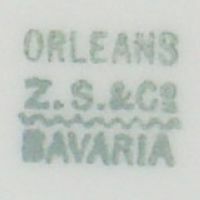 Used between 1880 and 1918, version with the 'ORLEANS' series name. 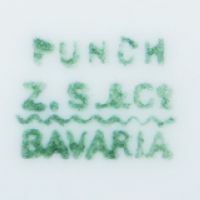 Used between 1880 and 1918, version with the 'PUNCH' series name. Basic mark as before but with 'GRANUTECO' - the same weird name can be found on ⇒Krister items. Who knows more? Used between 1881 and 1910, here with 'REMBRANDT'. The Rembrandt series itself went on until 1918. 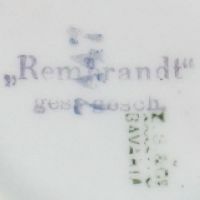 Used between 1882 and 1918, the so-called 'picture frame' mark. 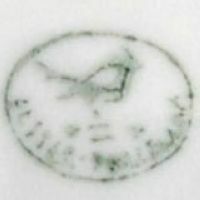 Used between 1882 and 1918, example of the so-called 'picture frame' mark in green. 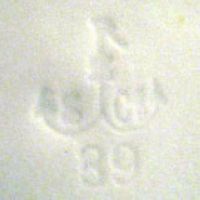 Used between 1882 and 1921, impressed anchor version. 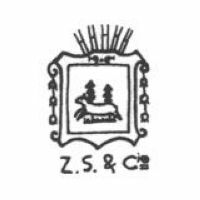 Used between 1882 and 1921, with initials 'Z S & CO'. 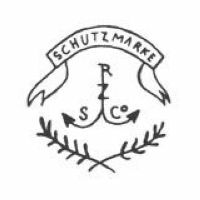 Used between 1882 and 1921, slightly different version with ⇒Schutzmarke banner. 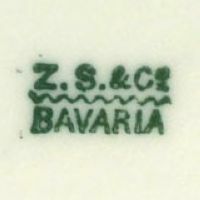 Used between 1896 and 1906, oval with 'BAVARIAN CHINA GERMANY' around fancy 'Z, S & Co' in green. Used between 1899 and 1910. Version without swords was registered at the ⇒R.W.Z.R. under №·40·029 on October 3rd 1899. Used between 1899 and 1910, red version mostly (but not always) used on combinations of hand-decoration and transfers. Used between 1899 and 1910, note that this version has swords included. 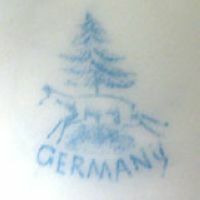 Used between 1904 and 1918, blue version. 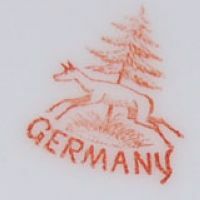 Used between 1904 and 1918, red version. 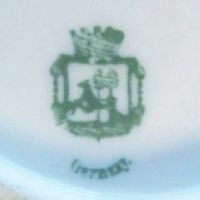 Used between 1918 and 1930, shows a deer between two trees jumping over a river. Note that 'ZEHSCHERZER' is written as one word. 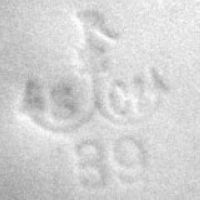 Used between 1918 and 1930, here an early example still combined with an older mark. Used between 1924 and 1935, see history above. Text reads 'ELSTER-PORZELLAN'. Used between 1930 and 1945. The 50 year anniversary mark was used 1930. The 60 year anniversary mark was (of course) used 1940. Same as before but with here shown with retailer addition. 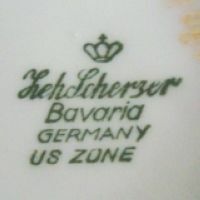 Used between 1946 and 1949 with 'US ZONE' addition. 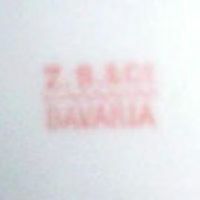 Used between 1949 and 1991. Used between 1949 and 1991. 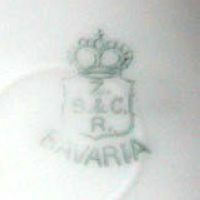 Slightly altered version with curved 'BAVARIA GERMANY' and series name 'ELITE'. 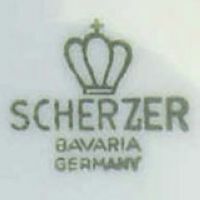 Used between 1949 and 1991, note that it only states 'Scherzer'. Used between 1989 and 1992, with founding year '1880'.